Fan Appreciation Giveaway! 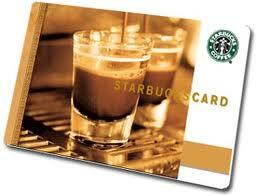 $10 Starbucks Gift Card! I have another Starbucks gift card I will never use, so I've decided to give it away to one of my lovely Facebook fans! The only mandatory entry is to be a fan, which I'm sure you already are which makes this a super easy giveaway to enter! I did make an optional entry though. I would love to hear your thoughts about what I can do to improve my blog/page. Just leave a blog post comment with anything you'd like to see more or less of, if there's any certain feature you'd like me to add...anything, good or bad...I want to hear it! nice giveaway : ) Hope i win! First thing I noticed about your blog was your beautiful layout. I LOVE the colors and it's so easy to follow. I see lots of blogs with confusing layouts, and it really makes me not want to read them, but yours is simple and lovely! I just <3 your site, It makes saving and getting great deals soo easy. Thank you! I like your simple and easy to read layout. I also enjoy all the giveaways. Thanks! I love you choice of colors, the background. However, you should post more often. I like that you do giveaways, I need to figure out how to start doing that. I also love your layout! Thanks for the chance~~ My printer stopped working, so I need the links to some coupons that have the option to be printed or mailed. Thanks for the chance!! I like that you respond :) Not all bloggers do that. :) Thanks. I do like the simple layout and the giveaways for stuff everyone likes! Maybe, add the Googgle+ link? I'm a new visitor and so far I like what I see. Incredible deals! I like your simple uncluttered straight forward approach. Sometimes its better to leave a good thing alone. I think you site is very nice. If you are looking to gain more popularity, you might want to include some SEO terms on your website so that the visibility of a your website will rank higher in google. I think your blog is great! Happy Holidays. I would love to see a rebate section. What I like about your blog is that it isn't over crowded with ads. This makes it easier to find things. I love all the giveaways of course! It is really nice that you go to all that work for us to be able to win something :) Thanks! I really love all the deals you post! I look forward to reading your blog every day! I really love your posts! Everyday I find myself heading to your site for a great deal, giveaway or interesting tidbit! your layout is nice, love your page design, it's colorful and cheery! I love ur emails. You always post great deals. I love your blog layout and especially your fun upbeat attitude! I love the name of your blog! Wishful thinking 247. I like the colorful layout that makes it appealing to stay and look at things on your webiste. I do not have anything negative to say at this time. But I will keep a look out and will leave you a comment if I do. Love the layout, your posts, the giveaways (of course... lol)! Can't think of anything different. I would like to see a coupon database. First off, I love the layout and overall look of your page. It is colorful, yet doesn't take forever to load. It is also very efficiently organized. I love the directory and coupons! I love how easy you make it to enter contests. always has the latest deals! I like the giveaways, the up to date coupon and product information, and the colorful but not overcrowded appeal of your layout. Been a fan for a while :) Love the freebies and good deals you post! I used to never enter the giveaways - just started doing that recently. Thanks for all you post and all the time you invest! Love your site. Very nice layout! Hope I win! I like all the cool deals you post and of course the giveaways! Thanks for all your hard work. I love Wishful Thinking! It's one of my "must Check" sites everyday. Thank You for the time you t ake to bring us great deals to save us money. Have a very Merry Christmas and a healthy and Prosperous New Year. Thanks so much for the gift card to Starbucks its gonna make a nice gift for a friend of mine who has been a bit depressed lately with facing the possibility of losing her house and transportation and she cant even afford to buy her favorite Starbucks coffee so I am gonna give her just a bit of cheer for the holiday so thanks again.